Mutant Massacre represents something of a minor game changer in the world of the X-Men titles that Marvel was producing. 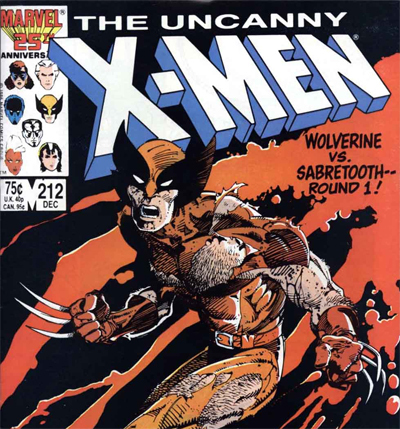 Originally proposed by Uncanny X-Men scribe Chris Claremont as a story to be told within that title, editorial seized upon the opportunity to connect their developing line of mutant titles, having each monthly issue of Uncanny X-Men, X-Factor and The New Mutants serve as a single chapter in an expansive storyline. It really was the first X-Men crossover, setting the template for dozens to follow over the coming decades from “thematic” crossovers like Fall of the Mutants to more straight-forward examples like Inferno or X-Tinction Agenda, or even ones that came long after Claremont like Messiah Complex or Second Coming. More than that, though, Mutant Massacre demonstrated the key attributes of Claremont’s rapidly expanding universe, reintroducing a sense of uncertainty and dread into the comics. The story of Mutant Massacre is relatively straightforward: the Morlocks, a community of less-than-photogenic mutants living beneath the streets of New York, are brutally slain by a band of psychopaths, while Claremont heightens the anti-mutant sentiment to create a palpable sense of unease. I think that the reason Mutant Massacre works so very well is because it exemplifies all the great hooks of the X-Men as a franchise. I think part of the reason that the X-Men have latched onto public consciousness is because of their status as outsiders and potential stand-ins for just about any minority. I mean, if you look at Bryan Singer’s X-Men films or Matthew Vaughn’s X-Men: First Class, that’s the hook right there. The X-Men are stand-ins for just about any minority, and the prejudice they are subjected to seems more potent a threat than any mind control or death ray, precisely because it’s a reflection of the real world. And there’s something more insidious about all this, as Callisto observes while touring the rebuilt tunnels under Manhattan. It isn’t just the people who were attacked, but the entire culture was scorched from the face of the Earth, and the outer world doesn’t seem to care (save the gangs fighting over the territory in the Daredevil issue). “Nothing left — no bodies, no clothes, no keepsakes? !” Callisto exclaims. “Our existence has been wiped… from the face of this stinkin’ world!” Let’s ignore the role that Thor’s well-meant funeral pyre played in this, and just observe how similar this feels to any number of real-life ethnic purges. It’s especially potent when Claremont juxtaposes it with more “casual” anti-mutant sentiment, like the insults (“mutie”) thrown at Rogue while she’s out shopping or the mob chasing Nightcrawler for the “crime” of looking different (“human law is for human beings!”). It’s an echo of the scene that introduced Nightcrawler way back in Giant-Sized X-Men, but it seems all the more sinister because it takes place in New York, a city that’s supposed to be multi-cultural and understanding, rather than some small unnamed European Village. 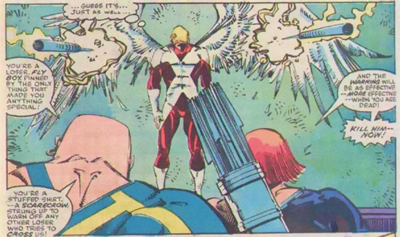 While Claremont has his faults as a writer (though his tendency for melodrama actually seems quite tempered here, though that may just be in comparison to Louise Simonson’s handling of angst magnets Cyclops and Angel), he does build atmosphere really well, and the prologue to the crossover featuring Magneto and the Hellfire Club is fairly foreboding – a sign that nothing is certain. “You consider us villains, we consider you fools,” Sebastian Shaw suggests, “those days, those labels must be cast aside.” I think that one of the defining features of Claremont’s tenure on Uncanny X-Men, and one of the things that gave his book its energy, was the way that everything was always shifting and in flux. There wasn’t really a default status quo for the series to return to or move towards. Some of the most iconic X-Men would depart, some of their most hated foes would join. Strange circumstances would create strange bedfellows. Marvel has, to date, only collected as from the start of Claremont’s run to The Dark Phoenix Saga in oversized hardcover. There’s a rather considerable gap between the end of this story and the start of that one (although, in fairness, it should be noted Marvel has done a great job collecting Claremont’s run from this point forward). As such, picking up the book feels like a collection of snapshots in the family album, and there’s a marked contrast between the team we left and the team we join, providing an illustration of just how Claremont evolved the team. “Magneto was once our deadliest foe,” Colossus explains, “yet today he is headmaster of this school.” There’s wonderful irony in Cyclops and the original X-Men playing mutant-hunting villains in X-Factor while Magneto somehow finds himself playing the guardian of Xavier’s dream. Even Wolverine and Nightcrawler, once the new recruits, are now officially the old guard, worn-out old war horses. 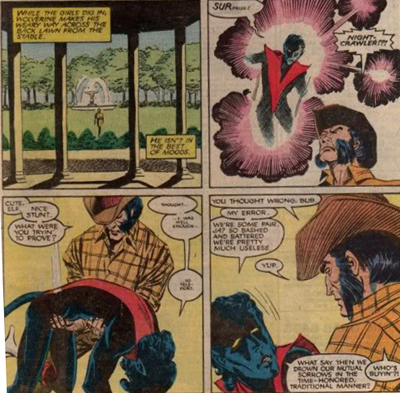 “We’re some pair, ja?” Nightcrawler jokes. “So bashed and battered we’re pretty much useless.” Claremont had been writing the book for almost a decade at this point, and it’s to his credit that he managed to keep things as fresh as he did. In fairness, skipping between the last oversized hardcover and this one, I do appreciate Claremont’s style just a bit more. The writer has a tendency to introduce a given character with a thought-balloon monologue about where they are right now and what their powers and circumstances happen to be. This can be quite infuriating when reading a large collection of issues back-to-back (like, say, an Uncanny X-Men Omnibus), but actually helps make each and every issue accessible. 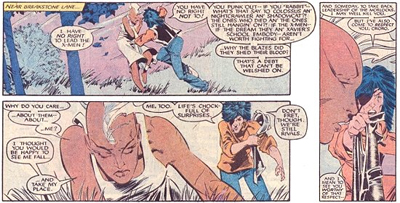 If you can get past some of the corny dialogue and purple prose, it’s actually fairly easy to jump into Claremont’s Uncanny X-Men at almost any point. That said, I do think there has to be a happy medium found between the two extremes. Perhaps the most shocking aspect of the Mutant Massacre, and what makes it so powerful, is the fact that our heroes lose. They don’t save the Morlocks, at least not in any large number. Such a massive loss of life and the fact that the X-Men are pretty ill-equipped to deal with it (Wolverine and Nightcrawler are wounded going into the story, quite a few more are wounded coming out from it), helps the story to pack a considerable punch, even today. 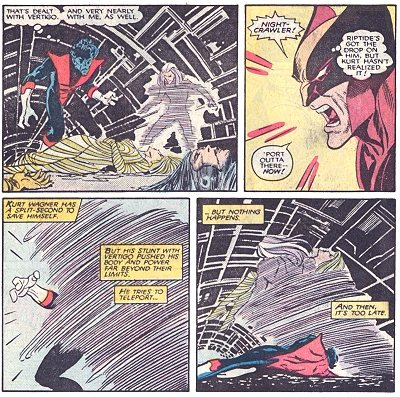 Of course, Uncanny X-Men famously killed a core team member near the start of its run (the ill-fated Thunderbird), and that help shake things up – it created the impression that nobody on the team was especially safe and that things could change suddenly and without warning. Claremont certainly fosters the same sort of atmosphere here, with the story serving as something of a reminder that this isn’t The Avengers or Fantastic Four. Bad things happen. People die. Heroes fail. It’s kinda funny that the X-Men should really be the most human of Marvel’s superhero teams. And Claremont does drive out change from the event. Even as we read it, we get a sense that the characters are undergoing serious effects. This isn’t something that they will just shake off – this is a grand transformative experience for the team. As Callisto remarks, “Life — for Morlocks and X-Men both — will never be the same!” And it’s to the credit of Claremont as a writer that it doesn’t sound like hyperbole. Magneto calls it “a war” and perhaps he’s right, and there are casualties. 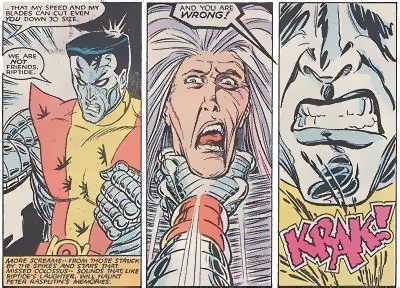 The series turns Colossus, the youngest of the “all-new, all-different!” X-Men, into a killer. It has Wolverine strike out on his own. Storm has a crisis of conscience and doubts herself as a leader. I’ll be the first to concede that Claremont is the king of comic book soap opera, but he handles a lot of it with considerable gravitas, only occasionally veering into purple prose. Though most of the darker elements on display here are handled relatively well, there are occasional moments that seem just a little strange. In particular, the villain Scalp Hunter, the man who seems to be directing the massacre, looks to have a body composed entirely on machine guns (at least when he appears in Uncanny X-Men). I know he’s a brutal sadist, but that actually looks kinda silly – it takes me out of the story just a little bit. There are only a few moments like that, and the story actually works remarkably well as a relatively buttoned-down story. However, I’m not entirely convinced that the “crossover” format of the story works especially well. Each of the books heading into the event carries its own baggage, and their own recurring plot devices. The grim and foreboding (and relatively understated) atmosphere Claremont has been building in Uncanny X-Men is somewhat undermined by the whiny angst Louise Simonson gives Angel in X-Factor. I appreciate mutant soap opera as much as anyone (I am working my way through Claremont’s X-Men after all), but there’s a time and a place for romantic subplots. 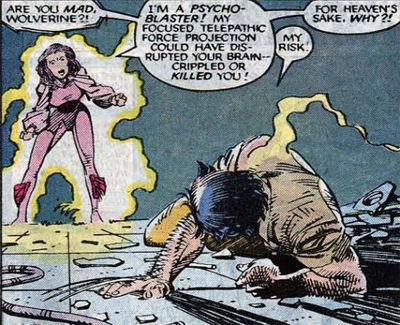 Mutant Massacre is not the place to hear Angel whining about how he loves Jean, who seems to have the mutant ability to generate pointless romantic subplots in every book where she appears. There are slightly more pressing concerns. More than that, though, each of the books brings its own baggage in. There are two really surreal moments in X-Factor where Apocalypse (the team’s “big bad”) just pops in, does a bit of recruiting and leaves. It feels quite strange, especially since there’s enough going on that the appearance is completely unnecessary. I can understand that the crossovers add scope to the story, and that this was the first time such a things was attempted, and I’m aware that the books weren’t written to be read in this particular format, but it still feels a bit awkward. The collection also features a bunch of other issues that spin-off or intersect with the event. It feels quite strange, because they are all in the middle of their own thing. I recently read the Walt Simonson Thor omnibus, and the issue read quite well there – Thor just happened to wander into a superhero fight, just as he would have wandered into a supervillain to start any other plot. Thor meets the crew from X-Factor, and everybody goes on their way. It makes sense from Thor’s perspective. The problem is that it doesn’t really work here. We get a bunch of scenes set in Asgard for which we have no frame of reference, and which add nothing to the plot. The average X-Men fan probably has no idea who Baldar the Brave is, let alone why he’d be in a desert visiting witches. Also, while I don’t hate Power Pack with the same passion of some comic book fans, what the hell is the comic doing crossing over with any storyline involving the word “Massacre”? On the other hand, it’s nice to have some Nocenti Daredevil in the collection. It seems like Nocenti was particularly closs to the “X” office, with her Daredevil crossing over with Fall of the Mutants and Inferno as well. I wouldn’t mind having a nice collection of the author’s run. I’ve never read it fully, but I’ve picked up snippets – I adore the famous Acts of Vengeance crossover that she did which pitted Daredevil against Ultron. 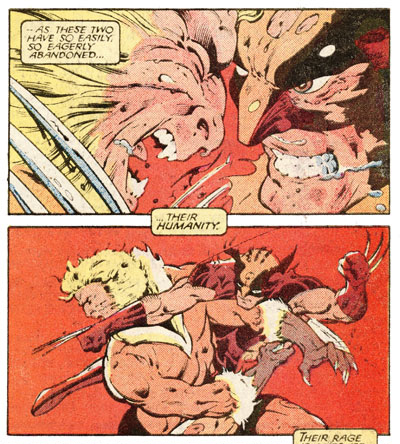 Anyway, back to the story at hand, which actually works surprisingly well as a stand-alone tale and something of an interlude in the larger crossover (while also exploring some of the aftermath of Born Again), with the Man Without Fear intercepting Sabretooth shortly after the atrocities, and allowing the author time to meditate on the difference between men and beasts. It might actually be the best handling of Sabretooth I’ve ever seen. The character has never been especially deep, and Nocenti uses that to her advantage. He’s a supervillain who exists to take part in big knock-down brawls like this. “Why do you want to fight me?” Daredevil asks. Sabretooth’s reply is almost tragic, “Because you exist.” As a father remarks to his son, “He hungers for the hunt, but will never know why.” Man, I would buy the hell out a Nocenti Daredevil collection. It’s been argued that the Mutant Massacre doesn’t rank with the very best of Claremont’s X-Men work is only because it lacks a finite ending. In the issues collected here, for example, don’t offer much by way of motivation for the brutal attack and don’t resolve too many of the plot threads. 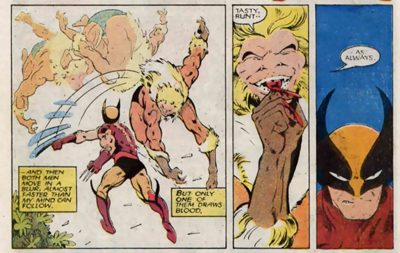 Mr. Sinister is only mentioned in passing by Sabretooth, and we don’t really know why he wants the Morlocks out of his way. Similarly, we don’t get too much of a reaction to the massacre, or any real idea of how Magneto and his students will respond, save the suggestion they are considering an alliance with the Hellfire Club. However, I don’t think that the charm of Mutant Massacre lies so much in its structure as a story. It arguably suffers quite a bit from Claremont’s more obvious weaknesses: it sets up more than it resolves, and it functions as more of springboard than as a story of itself. However, I think the arc works so well because of the mood that the writer so skilfully evokes. It’s solemn and dark, a reminder that we shouldn’t take happy endings for granted in X-Men comics, and also a superb illustration of the type of threats that mutants face merely by virtue of being born. It plays well off these themes, and I think that the thematic strength of the story holds it together remarkably well. All in all, it’s a nice and thorough little collection that fills another hole in Claremont’s still formidable seventeen-year tenure on Uncanny X-Men. While I think the crossover renders the story just a little bit too cluttered to be compared to The Dark Phoenix Saga, it does represent something of a highlight in an impressive run. It demonstrated that the X-Men were fast evolving into their own relatively self-contained universe, able to support their own events. More than that, though, it captures a lot of the power and potency of the books, in a way similar to Claremont’s superb God Loves, Man Kills, tapping into the darker aspects of humanity that the franchise explores so very well. For a seventeen year run, Marvel sure needs to do a better job collecting it. There’s huge gaps of individual issues missing between these big events. Yep. But they seem to be speeding up. Two big omnibuses in the space of two years, plus oversized hardcovers collecting the missing links around Inferno. Can’t complain too much.